A school shooting event is a traumatic experience for students, teachers and the entire community. These incidents can affect students’ decision about whether to stay at their school, affect their cognitive skills, and influence their behavior at school. There is currently sufficient data to enable us to measure the educational, psychological, economic and legal impacts of such events on students, teachers, school administrations and communities. 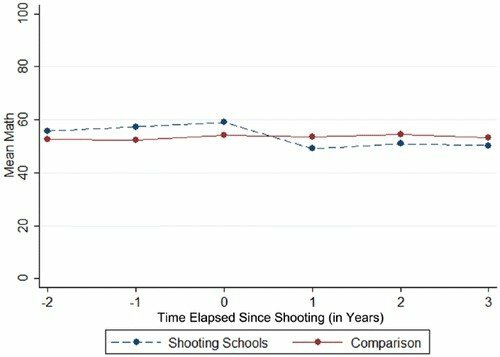 A recent study found out that: “…homicidal shootings significantly decrease the enrollment of students in Grade 9 and test scores in math and English standardized tests.” Furthermore, using student-level data from California, the researchers were able to confirm that: “…shootings lower test results for students who remain enrolled.” Interestingly, it appears that boys tend to be much more negatively impacted in terms of their test performance than girls. Other studies found that: “…adolescent violence exposure is associated with poor mental health outcomes later in life.” Such outcomes include depression, behavioral problems and lasting mental health consequences. Legal consequences of schools shootings can be severe, long-lasting and impact both organizations and individuals. Families of the victims of the Marysville-Pilchuck High School shooting (2014) filed lawsuit against school district and father of shooter Jaylen Fryberg. Parents of victims have sued parents of shooters after three recent school shooting sprees in Kentucky, Mississippi and Arkansas. Two of the lawsuits also name teachers and other school officials as defendants. All six of the fatal school shootings that occurred in 2015 and 2016 have produced massive lawsuits by the victims’ families. Families sued school boards, principals, teachers, parents, students, gun makers, and even Hollywood. After the Columbine massacre, parents of killed and injured students brought 17 lawsuits, against the Colorado school district, law enforcement officials and the parents of the two shooters. Likewise, after the deadly Virginia Tech shooting, families of many deceased students brought claims against the Virginia Tech administration. In this last case, the interim costs associated with the shooting topped $48 million, mostly borne by tax payers. Click HERE to download a PDF copy of this post. Louis-Philippe Beland, Dongwoo Kim, The Effect of High School Shootings on Schools and Student Performance, Educational Evaluation and Policy Analysis, (2016), Volume: 38 issue: 1, pp. 113-126. Poutvaara P., Ropponen O. (2010). School shootings and student performance (IZA Working paper).